Note to editors: There are two maps and one image associated with this press release. Erdene Resource Development Corp. (TSX:ERD) ("Erdene" or "Company") is pleased to provide additional assay results from the Company's on-going 2017 drill program at its 100% owned Bayan Khundii Gold Project ("Bayan Khundii") in southwest Mongolia where two drill rigs are currently operational. The drill holes discussed today include three holes completed north of the Midfield Zone (BKD-110 to -112), five holes drilled east of the Midfield Zone (BKD-113 to -117), one hole completed east of the Striker Zone (BKD-118), three holes completed south of the Striker Zone (BKD-119. -128 and -129), and four holes completed in the Northeast Zone (BKD-120 to -123). A plan map has been attached for reference. Holes BKD-110 and BKD-111 successfully intersected a new gold zone north of the Midfield Zone (see Table 1 below) and support the extension of the high-grade corridor that runs north-northeast from Gold Hill through Striker and now beyond Midfield, and trending towards the Northeast Zone, 500 metres northeast of Midfield. Results are pending for two step-out holes 130 metres and 200 metres north of the Midfield Zone (BKD-154 and BKD-140) where visible gold has been observed in drill core. Hole BKD-110 was collared 60 metres north of the northernmost hole at the Midfield Zone. 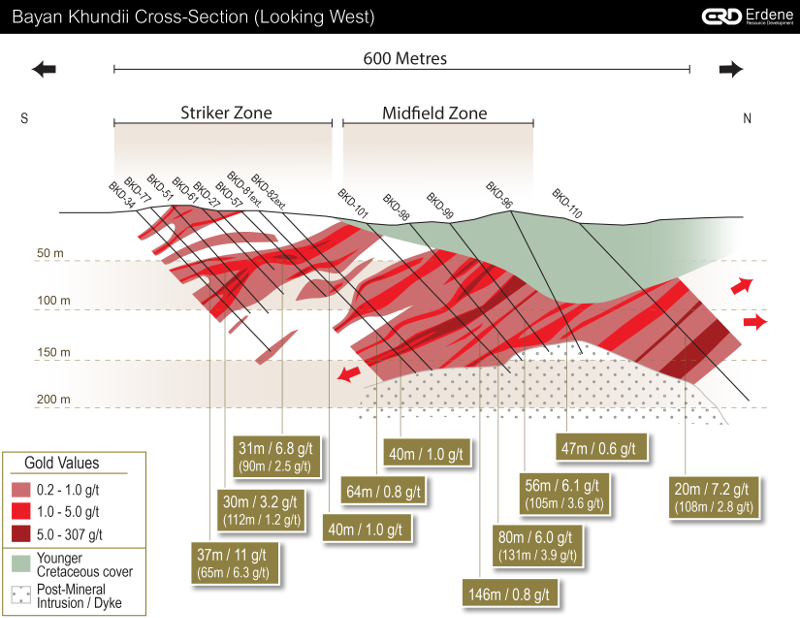 The hole targeted a geophysical resistivity high anomaly and intersected 108.3 metres of 2.8 g/t gold starting at 97.7 metres (69 metres vertical depth) including a 20-metre interval of 7.2 g/t gold. The hole contained strong to moderate silica-illite alteration with numerous quartz veins, some with specularite and/or visible gold. As shown in the attached photo from 144 metres depth, the visible gold is locally concentrated in the centre of recrystallized comb-textured quartz veins. This represents the most strongly mineralized comb-textured vein observed to date at Bayan Khundii. Mineralization continued to 206 metres (146 metres vertical depth) where it intersected an un-mineralized sequence of ash tuff and underlying fine-grained lapilli tuff. Hole BKD-111 was collared 40 metres east-southeast of BKD-110, and 50 metres north-northeast of the northernmost hole at the Midfield Zone. The hole intersected 55 metres of 2.9 g/t gold, including 25 metres of 5.3 g/t gold. It should be noted that no visible gold was reported in this hole. BKD-111 terminated in a post-mineralization syenite intrusion at 185 metres depth (131 metres vertical). Hole BKD-112, located 50 metres east of BKD-111, intersected 134 metres of unmineralized Cretaceous sediments followed by a post-mineralization syenite intrusion. 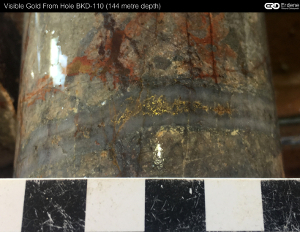 Importantly, holes BKD-140 and BKD-154 (results pending), located 90 metres northeast and 50 metres north of BKD-112 respectively, contained visible gold in drill core. These holes intersected altered Devonian tuffs at 61 to 69 metres vertical depth indicating the thick Cretaceous cover observed in BKD-112 thins significantly to the north and northeast. A thinning of the Cretaceous cover to the northeast is also suggested by geophysical resistivity surveys. These step-out results confirm that gold mineralization exists under cover north of the Midfield Zone and demonstrate the potential for the identification of additional gold mineralization towards the Northeast Zone, located 400 metres to the northeast of BKD-111. (1) Reported intervals are not true width. At this time, there is insufficient data with respect to the shape of the mineralized system to calculate true orientations in space. They represent drill intersection widths from holes drilled at a dip of -45 degrees and oriented to the north-northeast. The Bayan Khundii mineralization is interpreted to be moderately dipping (approximately 40 to 50 degrees to the southwest). A single hole was completed 90 metres east of the Striker Zone (BKD-118). The hole was a step-out hole targeting a potential eastern extension of the Striker Zone under younger cover. BKD-118 intersected high-grade gold mineralization including 10 metres of 12.8 g/t gold from 106 to 116 metres (see Table 2). This new zone opens up a large un-tested area east of Striker for additional exploration. The Company plans to complete additional drilling in this area before the end of Q2-2017. (1) Reported intervals are not true width. At this time, there is insufficient data with respect to the shape of the mineralized system to calculate true orientations in space. They represent drill intersection widths from holes drilled at a dip of -60 degrees and oriented to the north-northeast. The Bayan Khundii mineralization is interpreted to be moderately dipping (approximately 40 to 50 degrees to the southwest). Four, wide-spaced drill holes were completed in the Northeast Zone, 500 metres northeast of the Midfield Zone (BKD-120 to BKD-123). All holes, except BKD-120, intersected altered and mineralized Devonian volcanic units. Hole BKD-122 returned the highest and widest grades reported in this area to date. This hole, located on the southern boundary of an outcropping area of altered Devonian tuffs, returned 14 metres of 0.75 g/t gold from surface, including a 2 metre interval from 11 to 13 metres that returned 4.4 g/t gold. In addition, a 61-metre interval from 63 to 124 metres averaged 0.34 g/t gold, including 21 metres of 0.72 g/t gold starting at 65 metres depth. Additional follow-up drilling is now planned for this area. (1) Reported intervals are not true width. At this time, there is insufficient data with respect to the shape of the mineralized system to calculate true orientations in space. They represent drill intersection widths from holes drilled at a dip of -85 and oriented to the north-northeast. The Bayan Khundii mineralization is interpreted to be moderately dipping (approximately 40 to 50 degrees to the southwest). A series of three, 20-metre spaced step-out holes (BKD-119, -128 and -129) were designed to test the down-dip extension of the Striker Zone to the southwest. BKD-129 intersected 20 metres of 2.6 g/t gold from 90 to 110 metres and included an 8-metre interval of 5.7 g/t gold. 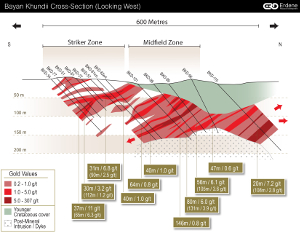 Hole BKD-128 intersected 42 metres of 0.32 g/t gold from 96 to 138 metres and hole BKD-119, the western-most of the three holes, intersected 44 metres of 0.32 g/t gold from 106 to 150 metres depth. These three holes were successful in extending the Striker Zone down-dip. The Striker Zone remains open in all directions. In addition, BKD-128 intersected 14 metres of 2.81 g/t gold from surface. This near-surface mineralization was previously reported in several other holes in the vicinity of BKD-128, including: BKD-17, 0 to 12 metres of 2.3 g/t gold; BKD-28, 0.8 to 19 metres of 1.1 g/t gold; BKD-46, 2.3 to 19 metres of 16.7 g/t gold; and BKD-51, 0 to 9 metres of 1.0 g/t gold. This series of holes defines a zone of significant mineralization at surface in this area vertically above the Striker Zone. (1) Reported intervals are not true width. At this time, there is insufficient data with respect to the shape of the mineralized system to calculate true orientations in space. They represent drill intersection widths from holes drilled at a dip of -45 to -50 and oriented to the north-northeast. The Bayan Khundii mineralization is interpreted to be moderately dipping (approximately 40 to 50 degrees to the southwest). A series of drill holes (BKD-113 to 117) were completed east and southeast of the Midfield Zone and intersected a combination of Cretaceous sedimentary rocks, less altered and mineralized Devonian volcanic rocks and a syenite intrusion. All holes intersected low levels of anomalous gold mineralization (i.e. greater than 0.1 g/t gold and up to 1.36 g/t gold) over relatively narrow intervals in both the Devonian volcanic rocks and at the basal conglomerate contact. However, as noted above, holes BKD-140 and BKD-154, located north and northeast of this area and for which results are pending, both contained visible gold in drill core. Holes BKD-140 and BKD-154 intersected altered Devonian tuffs at 61 and 69 metres vertical depth, respectively, indicating the deeper intervals of the overlying Cretaceous units observed in this area east and southeast of the Midfield Zone are thinning to the north, consistent with our interpretation of the geophysical resistivity surveys. The initial Q2-Q3 2017 exploration program at Bayan Khundii, which commenced in mid April, will include a projected 20,000 metres of diamond drilling, designed to initially expand areas of gold mineralization surrounding the Gold Hill, Striker and Midfield zones, and to identify new zones elsewhere within the larger 2-kilometre by 1.8-kilometre Bayan Khundii project area. Once complete, any new or expanded zones will receive more detailed drilling to increase confidence in advance of an eventual resource estimate. One drill rig is continuing with the exploration program while the second drill rig is dedicated to the closer-spaced resource delineation program. 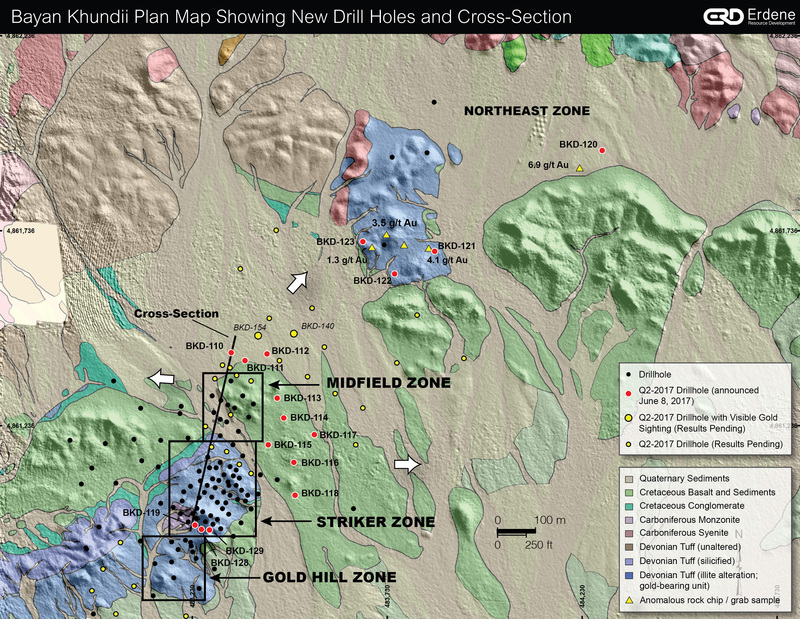 In Q2-2015, Erdene conducted an initial exploration program on the southern portion of the Company's 100%-owned Khundii exploration license in southwest Mongolia. An early rock-chip sampling program revealed multiple very high-grade surface quartz veins that returned up to 4,380 g/t gold, leading to a comprehensive exploration program that has included: geological mapping; soil geochemical surveys; additional surface rock chip sampling; a ground magnetic survey; gradient array and dipole-dipole induced polarization surveys; and the completion of 11,300 meters of drilling in 96 drill holes (as of Q4-2016). In addition to this work, a series of detailed follow-up studies have also been completed, predominantly on drill core and minor surface outcrop, including: petrographic and mineralogical analyses; a fluid inclusion study; SEM gold composition analysis; Short-Wave Infra-Red Analysis (SWIR); structural analysis; and overall petrogenetic analysis. Drilling has revealed the presence of very high gold grades, with up to 306 g/t gold over 1-metre intervals, within broad mineralized envelopes, with up to 131 metres of 3.9 g/t gold, including 80 metres of 6.0 g/t gold. Detailed studies indicate the mineralized zones can be characterized as low-sulphidation, quartz-illite-adularia type mineralization that was presumably formed in a back-arc extensional environment. In Q1-2016, the Company concluded preliminary metallurgical test work at Bayan Khundii, indicating that gravity concentration and cyanidation of the gravity tails yield very good overall gold recoveries for both high-grade and low-grade composites, yielding 99% gold recovery from the high-grade composite (24.9 g/t gold) and 92% gold recovery from the low-grade composite (0.7 g/t gold). Additional metallurgical work is underway with completion anticipated in Q3. The Bayan Khundii license has a 2% net smelter returns royalty ("NSR Royalty") in favour of Sandstorm Gold Ltd. with a buy-back option to reduce the NSR Royalty to 1%. Michael MacDonald, P.Geo. (Nova Scotia), Vice President Exploration for Erdene, is the Qualified Person as that term is defined in National Instrument 43-101 and has reviewed and approved the technical information contained in this news release. All samples have been assayed at SGS Laboratory in Ulaanbaatar, Mongolia. In addition to internal checks by SGS Laboratory, the Company incorporates a QA/QC sample protocol utilizing prepared standards and blanks. Erdene's sampling protocol for drill core consisted of collection of samples over 1 metre or 2 metre intervals (depending on the lithology and style of mineralization) over the entire length of the drill hole, excluding minor post-mineral lithologies and un-mineralized granitoids. Sample intervals were based on meterage, not geological controls or mineralization. All drill core was cut in half with a diamond saw, with half of the core placed in sample bags and the remaining half securely retained in core boxes at Erdene's Bayan Khundii exploration camp. All samples were organized into batches of 30 samples including a commercially prepared standard, blank, and either a field duplicate, consisting of two 1/4 core intervals, or a laboratory duplicate. Sample batches were periodically shipped directly to SGS in Ulaanbaatar via Erdene's logistical contractor, Monrud Co. Ltd.
Erdene Resource Development Corp. is a Canada-based resource company focused on the acquisition, exploration, and development of base and precious metals in underexplored and highly prospective Mongolia. The Company has four exploration licenses and a mining license in southwest Mongolia. In addition to the Bayan Khundii and Altan Nar projects, other deposits and prospects within these licenses include: Khuvyn Khar - an early-stage, copper-silver porphyry project with multiple drill targets and significant copper intersections; Nomin Tal - a narrow, high grade copper-gold discovery; Zuun Mod - a large molybdenum-copper porphyry deposit; and Altan Arrow - an early-stage gold-silver project. In addition to the above properties, the Company has an Alliance with Teck Resources Limited on regional copper-gold exploration in the prospective Trans Altai region of southwest Mongolia. For further information on the Company, please visit www.erdene.com. Erdene has 145,550,586 issued and outstanding common shares and a fully diluted position of 156,592,160 common shares.